Before Twilight, Sookie Stackhouse, and the Vampire Diaries – my books. my life. I think: Christopher Pike has a new book? And it’s about vampires? I loved Christopher Pike when I was younger. Especially his other vampire series, The Last Vampire. I probably read it 6 times. I hope this one is as good. [I pick up the book and read the back]. Hmm…this sounds familiar. 5,000 years? Creator returns? Ray? Wait a minute. This IS The Last Vampire! They’ve renamed it and reissued it in order to capitalize on the vampire craze. That was smart. 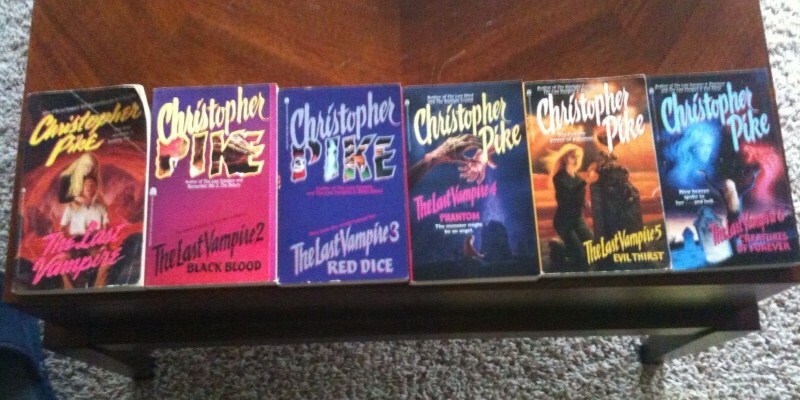 Teenagers today would probably pick up Thirst when they’d pass over the cheesy Christopher Pike covers of yore. How exciting that a new generation of girls are going to discover fantastic-ness that is The Last Vampire. I loved Christopher Pike in my early teens, but I can't for the life of me remember which books of his I used to read, not sure if it was this series or not! I looked him up on wiki, I think it must have been the Spooksville YA series I used to read. I don't think I read those ones. I only read his older YA novels. I thought so, too. Good marketing strategy.